Sorry, it's been so long.....it's a CRAZY summer! 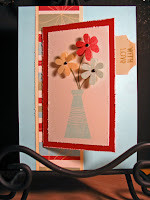 This is a 4.5 x 3 card adhered to a 5x7 card base (the only part that opens is the 4.5 x 3") using the June SOTM "With Love", Let's Get Together Paper Packet from CTMH, Cranberry, Breeze, Buttercup and Garden Green Ink Pads from CTMH and black bitty brads (NEW ITEM in the 2008 Summer Idea Book). 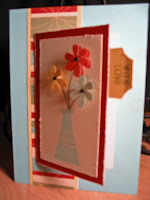 This is my attempt at showing you a close-up of the flowers and of the card open. I really need a new camera! 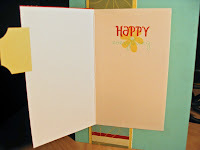 This is the inside of the card which says "Happy Everything" - "Happy" is stamped in Cranberry Ink, "Everything" is using Breeze and the flower is stamped in Buttercup Ink. This is the same stamp set but using two of the vases to make a lamp (got the idea off the CTMH Artwork BB - LOVE that place). 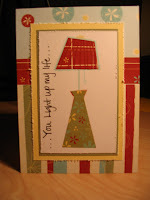 I hand-wrote "You light up my life" and used paper piecing for the lamp. This is a 4 x 5.5 card which opens "up" from the bottom. While the beach was nice, I was ready to return home to my BABY!!! Four albums.....75+ pictures....and 6 days to go. 9:20pm....16 pictures and 5 layouts DONE!!! 11:23pm....22 pictures and 7 layouts DONE!!! 10:40pm, June 10th.....38 pictures and 10 layouts DONE!!! Of course QT would find this amusing....but it really has a little more substance to it that just being BIG and YELLOW!! !